Colleagues in Official Papers, Bodleian Law Library, have organised two trials which may be of interest to historians and are now available via the UK Parliamentary Papers (UKPP) database in SOLO. Please send feedback to Hannah Chandler by 13 February when the trials end. Trial 2: new content added to the existing House of Lords material ‘House of Lords papers 1800-1910’. Please note we have access to House of Lords papers from 1900 to the present via Public Information Online. To search in either of these trials, use the Advanced Search in UKPP. Learn about UKPP and sign up for the Bodleian iSkills UK Parliamentary and Government materials – an introduction, Wed 23. Jan. @ 10-11.30am. 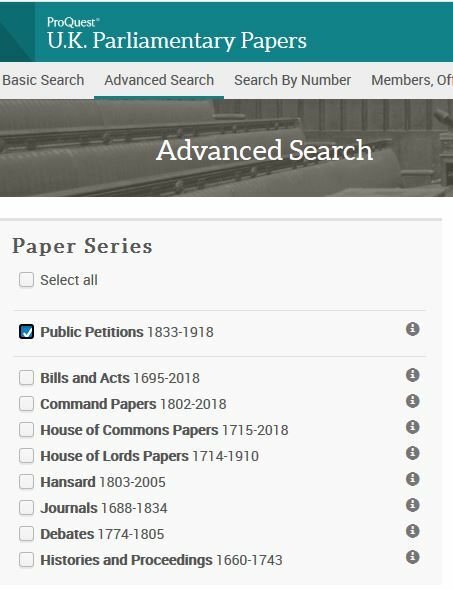 “Public Petitions to Parliament, 1833-1918 is an online module of Parliamentary Papers covering the records of the Select Committee on Public Petitions, 1833-1918. It includes individually rekeyed metadata records for every one of the >900,000 petitions accepted by Parliament and includes the full text of each petition that the Committee transcribed. Integrated fully with U.K. Parliamentary Papers, this collection shows how “the people” during the 19th C influenced Parliament on political, ecclesiastical, colonial, taxation, and many other topics relevant to the study of Britain and the British Empire within a range of different disciplines within the historical and social studies. Petitioning was by far the most popular form of political participation, but it has long been overlooked by historians and social scientists preoccupied with elections and election rituals, campaigns to extend the right to vote, and the rise of national political parties. Utility of public petitions can be used to study the groundswell of public pressure for the expansion of the voting franchise and also to see the views and priorities of both the populace and Parliament. How Parliament addresses the petition, or doesn’t address it, is a stark indicator of political and social priorities. Containing petitions on ecclesiastical issues, crime and criminals, colonies, taxation, education, and on every other issue of interest to the populace of Britain, this project appeals to all social, cultural, and religious scholars of Britain. From religious scholars interested on Methodism and the Church of England, scientists concerned with pollution and pollution controls during the Industrial Revolution, and sociologists concerned with how these issues were influenced by and influenced the People, the popular constitutionalism inherent in this collection (as opposed to the “top down” approach to looking at history), is at the cutting edge of historical research today and has wide appeal across campus.” From ProQuest LibGuide UK Parliamentary Papers (https://proquest.libguides.com/parliamentary/petitions, accessed 21/1/2019). As petitions are public responses to laws and contribute to the debate and formulation thereof, they add fantastic context to parliamentary proceedings. For instance, the current great flurry of petitions relating to Brexit are testament to the strength of feeling experienced amongst the British population in the country. Having access to historic petitions in the same database as historic parliamentary papers and debates (Hansard) will make it easier for historians to understand the national debate. You will also learn of individuals who were politically active locally and, for a brief period in the petition, also nationally. 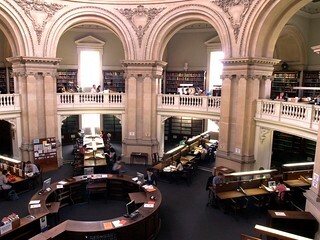 To find out more about individuals, you could search the Oxford Dictionary of National Biography ODNB Oxford subscribers only) or, if they are not important enough to get into the ODNB, try the British Biographical Archive which is in World Biographical Information System WBIS (Oxford subscribers only). Searching for “children” in Petition titles. From ProQuest UK Parliamentary Papers, Public Petitions 1830-1918. Please note that in the vast majority of cases you will only see a summary report of petitions compiled by the Select Committee on Public Petitions. Only 400 petitions in UKPP have the full-text of the original petition, added as an appendix to the Select Committee’s reports. If you wish, you are able to limit your search to find only the full-text appendices. 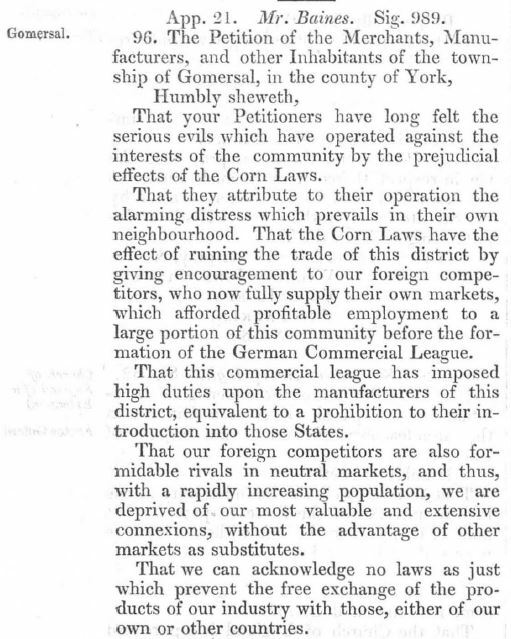 Searching for Petitions to repeal the Corn Laws with Appendix Full-Text. From ProQuest UK Parliamentary Papers, Public Petitions 1830-1918. 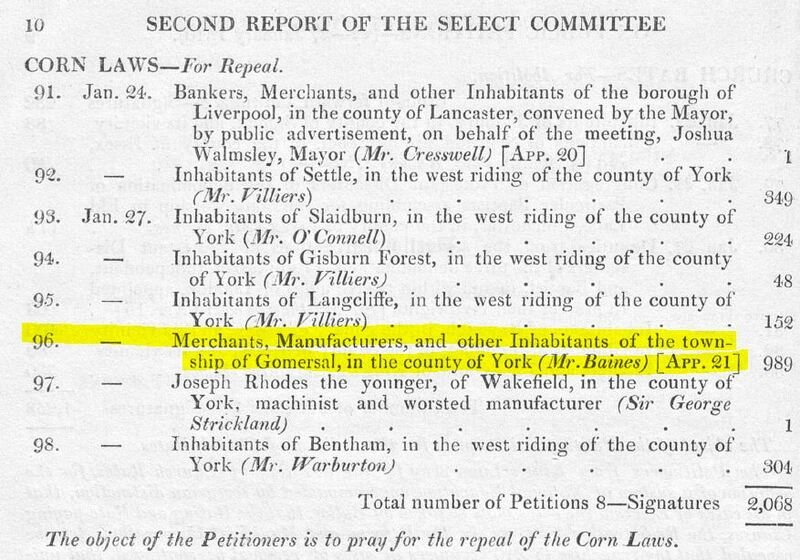 Merchants, Manufacturers, and other Inhabitants of the township of Gomersal, in the county of York; Corn Laws – For Repeal; Petition no 96. January 27, 1840. Parliament: 1837-41. Second Report of the Select Committee. From ProQuest UK Parliamentary Papers, Public Petitions 1830-1918. This entry was posted in Electronic resources, For Academics, For Postgraduate students, For Undergraduate students and tagged 19th century, government papers, modern history, Official Papers, petitions, sources, trial by iholowaty. Bookmark the permalink.